Now one of the bigger sports stories that broke out today is a throwback, a throwback to ten years ago and Super Bowl XXXVII. Legendary Raiders wideout, and should-be Hall of Famer, Tim Brown made headlines today with suggesting that Bill Callahan actively tried to lose that game to the Buccaneers. They, of course, got blown out by a 48-21 score. What makes this story even more bizarre is that Brown's former teammate, Jerry Rice, echoed those sentiments today on ESPN. This whole controversy comes about at a weird time, ten years after the fact, and with rumors having it that Callahan, the current offensive coordinator and line coach for the Cowboys, will be taking over playcalling duties in Dallas from coach Jason Garrett. Personally, I have no idea why Brown is making these comments now and they do come off as ridiculous. Here is why. 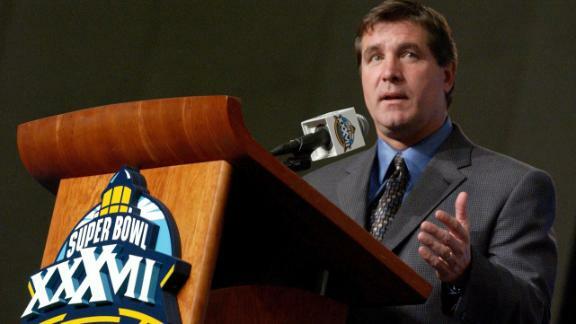 Now there is no question that Callahan was not popular with his players in Oakland, a statement proved by a near-mutiny in the 2003 season and multiple public comments by the coach himself in which he disparaged his players. But to suggest that he went into the Super Bowl intending to lose is completely ridiculous, as is Brown's suggestion that one of the reasons why he would want to do such a thing is that he hated the Raiders and had a "big problem" with the team from when Jon Gruden brought him to town as their offensive coordinator. It is impossible to say what Callahan's opinions of the Raiders were when he came to town but it is common sense that he would not have a problem with a team that gave him his first, and thus only, shot at an NFL job. His other main reason why Callahan would do such a thing was because he wanted to see his friend, Gruden, win it, which is a similarly flimsy argument. The suggestion that Callahan changed the gameplan midweek from focusing on the run game towards throwing the ball a lot also is sketchy. Yes, Brown notes that the Raiders had a bigger offensive line than the Buccaneers' defensive line but that Bucs line was stout against the run, tying for fifth in the league. And while it would have made sense for the average team to try to work the run against a team as good against the pass as Tampa was, the Raiders simply did not run the ball, they were a passing team and for good reason with an excellent receiving unit and a very good quarterback in Rich Gannon. They were first in the league in passing, 18th in rushing. And maybe Callahan did want to work in the rushing game, but the team also had a meddlesome owner who lived and breathed by the deep ball in Al Davis. Not to mention that their Pro Bowl center, Barrett Robbins, abandoned the team the day before the game, leaving the Raiders to utilize a little-used backup in the game. Speaking of Robbins, Rice put the blame of Robbins's disappearance, due to his failure to take his depression medication, on Callahan, saying that their center was distraught that Oakland was going to focus on the air rather than the run that he decided to bail on the team. And that reasoning is completely nonsensical. Robbins had a history of personal troubles and mental illness, especially since being diagnosed with depression during his college years at TCU, so to blame his actions the day before Super Bowl XXXVII on Callahan is ridiculous. Some of Brown's and Rice's teammate have come to the defense of Callahan after their inane comments. Bill Romanowski was "flabbergasted" at their accusations. Lincoln Kennedy cannot "wrap [his] arms around [the accusations]." Rich Gannon responded to the situation on his radio show on Sirius NFL radio. Gannon makes the widely accepted point that Callahan did not change their terminology from when Gruden coached the team the year before, a fatal mistake considering that Gruden was coaching their opponents in the Super Bowl. And that reasoning makes a ton of sense. What Brown and Rice are trying to say does not whatsoever.